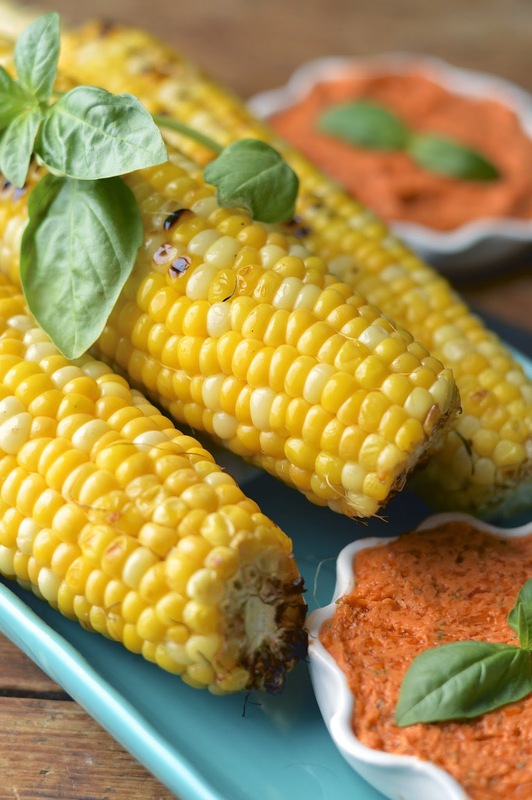 There are three flavors that just sing summer to me; tomatoes, basil and corn. The perfect warm weather trifecta. Not only do I love the taste of these foods, but I also love the smell. Basil is obvious. That sweet herbaceous anis scent suggests wonderful dishes such as Caprese salad or pesto on fresh pasta. The smell of fresh tomatoes and corn is a little less obvious. The specific aroma of corn silk while shucking the ears brings me back to childhood and performing this simple task on our back step to help my Mom out while making dinner. As well, I don’t love the smell of tomatoes specifically. I love the smell of tomato plants and the warm red fruit plucked on a beautiful sunny day. Yes, I am a little sentimental, but the power of certain smells and aromas can be very powerful and transport you to different times and places. 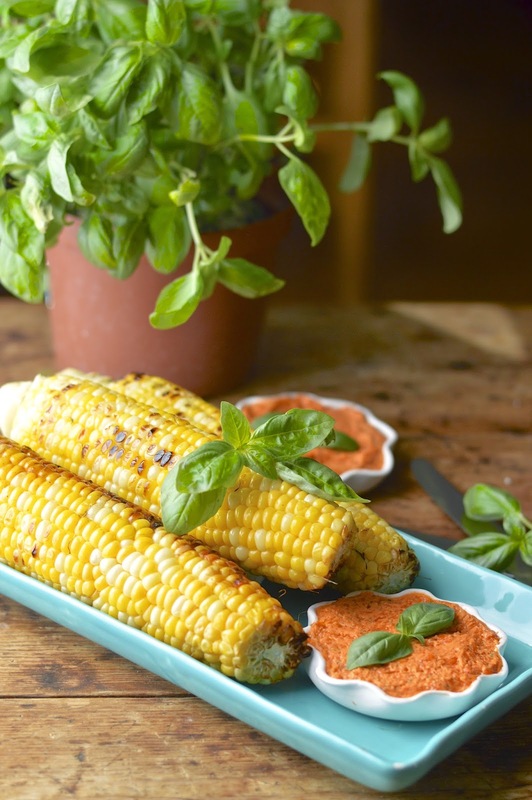 That is why I love this grilled corn on the cob with tomato basil “butter”. It’s my three favorite summer flavors wrapped up in one amazing bite. The butter is so easy to make. Since I am on a no dairy diet, I used 2 sticks of Earth Balance soy free buttery sticks (non-gmo and vegan). It worked beautifully with the benefit of non-hydrogenated expeller pressed oils and ALA Omega-3s (you can sub in real salted butter if you wish). With the addition of some roasted cherry tomatoes, fresh basil leaves and a food processor you have a spread that can be used for so much more than grilled corn. I slathered it on chicken and rice, but I’m sure it would also be a great spread for a crusty baguette, pasta and fish. This recipe makes enough butter to put in your refrigerator for a couple of weeks, to use as needed. And I think you’ll need to use it a lot! Pre-heat oven to 425 degrees F. Place tomatoes on a medium baking sheet and toss with olive oil. Bake for 15 to 20 minutes until tomatoes are soft, lightly browned and bursting open. Set aside to cool. In a food processor blend tomatoes and basil until completely pureed. Add "butter" sticks and process until completely blended and smooth. Scoop butter into a dish and refrigerate until ready to use. Pre-heat your grill to 400 degrees F. On a baking sheet, drizzle canola oil onto corn and roll the corn until completely coated. Sprinkle with Kosher salt. Grill corn ears for 15 minutes, turning occasionally, until lightly charred. 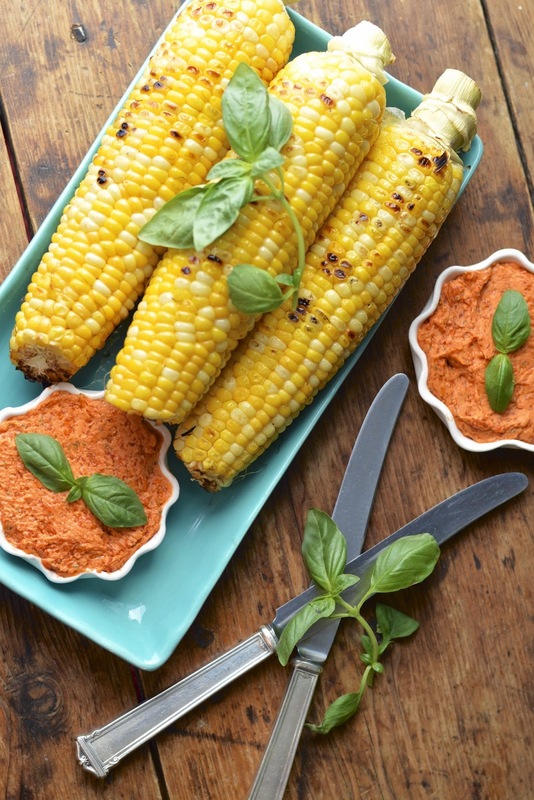 Spread tomato butter on corn and serve warm.